Achieve a grand and truly unique look in your home with the stunning designs of this beautiful collection. The Unit offers a variety of exquisite features such as hand carved solid wooden frames and base panels on each piece which are finished in a light finish which beautifully contrasts the dark chenille upholstery. Plush, comfortable cushions and accent pillows create a stylish and comfortable place to sit and entertain. With the available sofa, love seat and chair, you can create the seating combination that best fits your interior needs. Every detail on these pieces exude elegance and sophistication. The shapely curves, boldly contrasting colors and exquisite details of this collection are sure to enrich your home with elegant style and design. This unique model will create a sophisticated look to your formal living room. This model is known for the happy face frame! The elaborately carved wood frame wraps the curves along the front of the arms and the bottom of the frame, while wooden bun feet offer support and added detail. The chenille upholstered rolled arms add a traditional style of the piece. Decorative accent pillows add the finishing touch to this classic sofa set. 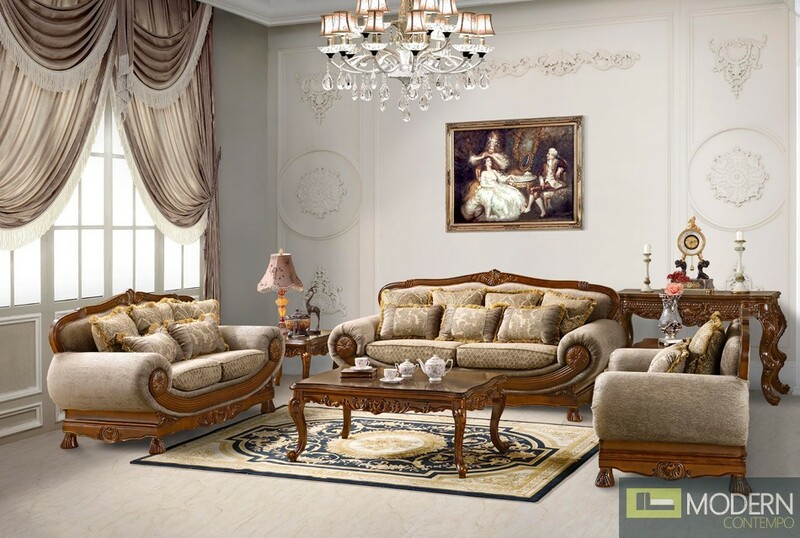 Dramatic style and uncompromising comfort are brought to life in the exotic shapes, natural colors and detailed wood carvings this amazing set has to offer.